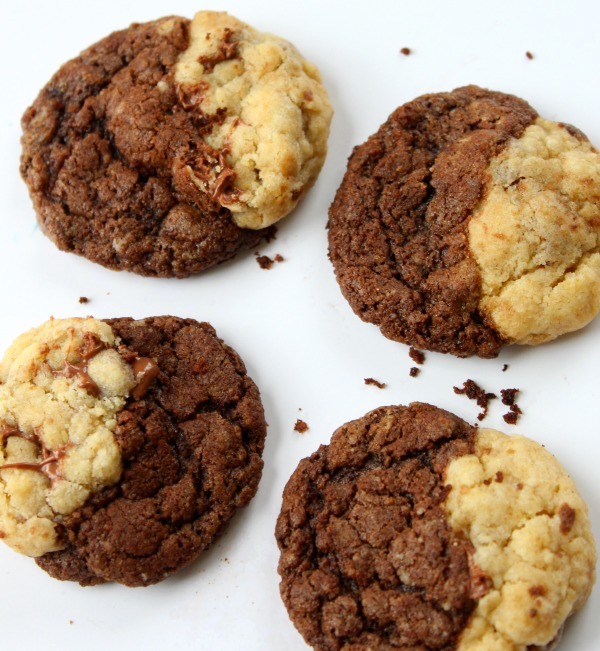 Have you ever craved chocolate chip cookies AND brownies at the same time? Get the best of both worlds with these Chocolate Chip Brookies! For an even more delicious dessert, top these with a scoop of ice cream right out of the oven. Your tastebuds won’t know what hit them! Beat together butter, sugar, brown sugar, eggs, and vanilla. In a separate bowl combine flour, baking soda, cocoa powder and salt. Slowly add dry ingredients to sugar mixture and combine until dough forms. In a separate bowl combine flour, baking soda, salt and chocolate chips. Combine dry mixture with sugar mixture and stir until dough forms. Roll together 1/2 inch ball of brownie batter and 1/2 inch ball of cookie dough forming a 1 inch ball of dough. Place on greased baking sheet. Repeat until baking sheet is full. I baked these cookies twice cause it was SO good! Wondering if the dough/cookies freeze well? Thank you!